I spent the last 3 days in the Eifel, which might possibly have felt like a huge time warp for me. It was beautiful but time definitely slows down over there. We went on 3 hikes in like a day and a half, that was awesome. I’ve never climbed to the very top of a castle before, that was definitely a highlight of the weekend!! Also making friends with little sheep! I love them even though they smelled. 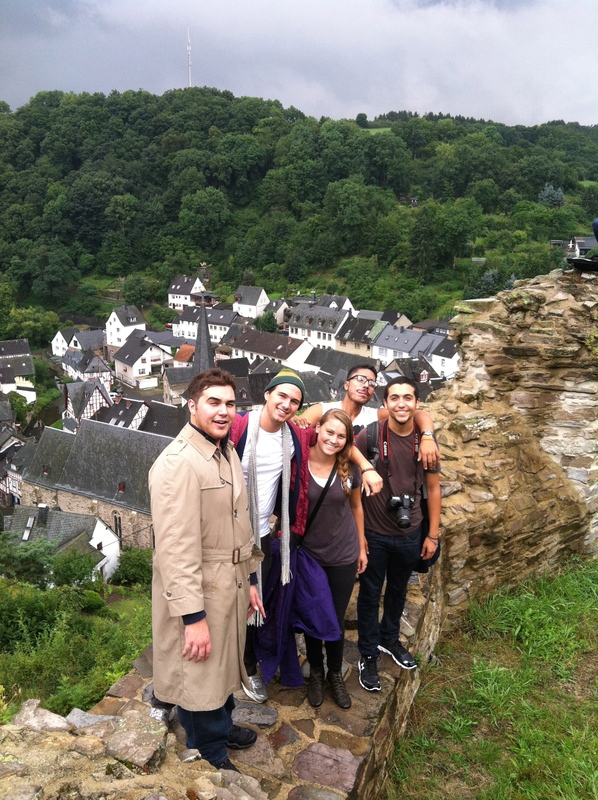 We climbed to the very top of a castle yesterday through the rain and potential ticks everywhere. I couldn’t help but annoy everyone around me asking, “do I have a tic in my hair? What do I do if there’s a tic on me? Will I die?” etc. Needless to say the hike was still wonderful and we felt so accomplished at the top. The Weingalerie we stayed at was so quaint and the beds were the most comfortable things EVER. I wanted to lay there and snuggle with my roommates forever. It was basically the willy wonka scene with the old people when it got really cold..we’re cool like that. We also motivated each other to get up at like 6 am for a 2 hour hike. That’s friendship right there. Not to mention here was the program’s version of our second hike: give us wine and then TORCHES for a torchlit night hike. Bravo with the creativity and clear logic on that one. 😀 I am forever grateful for it. Playing mafia with the whole group was also awesome and I couldn’t help but channel my inner mob wife and make it as the last two mobsters left. I think we have a really awesome group and I’m excited to see what the next week brings!